Minyak of China The Minyak are part of the Tibetan nationality. They have been described as a “peaceful, sedentary Tibetan tribe, a most inoffensive, obliging, happy-go-lucky people.” They live quiet lives in nearly complete isolation from the rest of the world. Almost all Minyak adhere to Tibetan Buddhism. 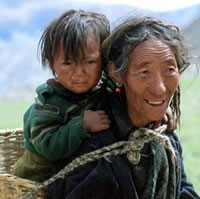 They observe Tibetan festivals and make pilgrimages to Tibetan holy sites. Ministry Obstacles The Minyak may fear disturbing community harmony, and desire peace more than truth. Outreach Ideas Workers are needed to carry the Gospel message to the Minyak community. Perhaps Han Chinese believers will shoulder the task. Pray for the followers of Christ Pray for followers of Christ to soon emerge from the Minyak community, that the Lord even now is preparing pastors and teachers for them. Pray for resources to be available to them, as well. Pray for the entire people group Pray for the light of the Gospel of Christ to shine in the Minyak community. The Discipleship of Jesus (Mark 9:33-50) by Bryan Baik.